Family entertainment is the order of the day when the Lichfield Garrick theatre unveils a charming tale about a missing chicken on Saturday 16 April. Little Angel Theatre is to present an engaging puppet show called Handa's Hen which is aimed at children aged two to five. Based on the book by Eileen Browne, Handa's Hen follows the story of Handa and her friend Akeyo as they go looking for Grandma's black hen Mondi. They find two fluttery butterflies round the hen house, three stripy mice under the grain store, and four little lizards behind the pots... But where is Mondi? This delightful and entertaining show features 55 stunning puppets all created by hand for this brand new production. Join in with Handa and Akeyo as they sing and dance in search of Mondi, meeting a host of colourful animals and birds as they go. Handa's Hen is brought to audiences by the same company that created Handa's Surprise. The London-based Little Angel Theatre is one of only three building-based puppet theatres in England. Established in 1961, the company has been providing high quality puppet theatre aimed at family audiences for over 50 years. As well as producing shows for its own theatre in London, they also tour nationally and internationally. Handa's Hen forms part of Lichfield Garrick's fourth family day, which is jam packed full of free activities and affordable workshops for the whole family to enjoy. Families can join in with the new Comedy School for Kids, bring out their creative side with local artists, follow the story-tellers on a magical adventure and have a go at writing poetry. 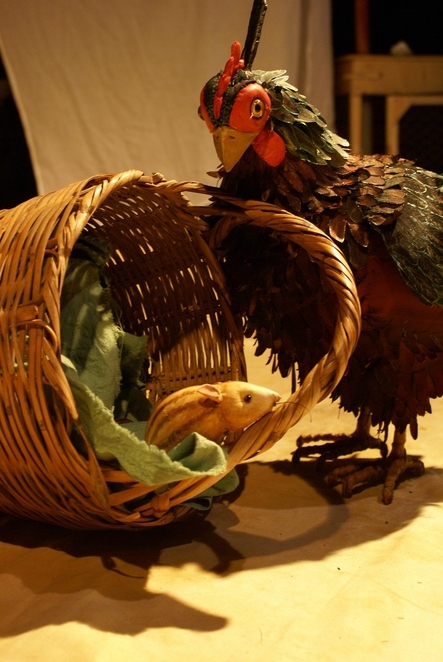 Don't miss Handa's Hen and the Lichfield Garrick's Family Day on Saturday 16 April. Tickets to see the show cost £10 for adults and £7 for children, and can be booked online or by calling the Box Office on 01543 412121.